Can you remember what you were doing last week? How about last month, or a year ago? Life-loggers like Narrative’s Clip promise to make that possible, a wearable camera snapping a photo every thirty seconds and then curating the best moments for you to look back through. The Swedish start-up took Kickstarter by storm back in late 2012, and has finally begun shipping the Clip, but does it do enough to warrant room on your lapel, or is it just all too creepy? Read on for the full SlashGear review. 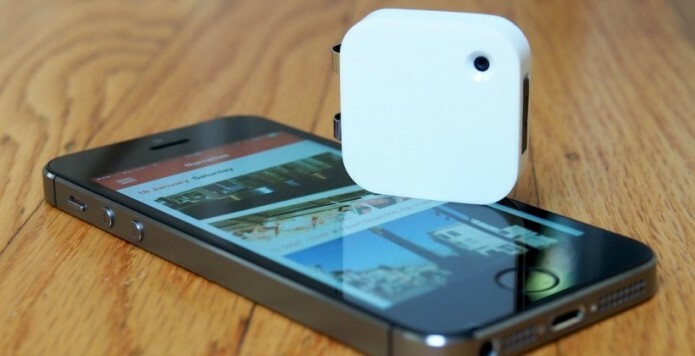 Narrative’s camera turned out to be tougher for the startup to create than expected. Small cameras have existed for some time, of course, but inside the 36 x 36 x 9mm, 20g plastic casing there’s not only the 5-megapixel BSI CMOS but GPS, an accelerometer, and a digital compass, along with a battery and 8GB of storage. There’s also a microUSB port for synchronizing and charging, covered with a slightly fiddly rubber flap, and a springy metal clip on the back. The Clip snaps 2560 x 1920 resolution JPEGs, one every thirty seconds while it’s powered on. The lens promises a 70-degree field of view and fixed-focus ranging from around 30cm to infinity. Sometime in 2014 Narrative plans to release a fish-eye lens attachment, which will clip onto the camera much in the way that add-on lenses for the iPhone work, and increase the field of view to 135-degrees. Narrative rates both the battery and the non-expandable storage as being good for around two days of recording. A row of four white LEDs along one edge shows status: double-tapping the Clip causes them to light up showing how charge status but also fires off a shot manually. Turning it face-down, or putting it into a dark pocket, sets it to standby mode. There’s no wireless built into the Clip; it doesn’t synchronize directly with your smartphone over Bluetooth LE. Later in the year Narrative plans a WiFi dock which will allow standalone uploading without needing a computer, ideal for leaving on your nightstand and also charging the Clip overnight, though there’s no specific release date for it. Instead, you’ll have to make sure to plug into your PC regularly. That’s frustrating at first – I wanted to see my photos straight away – but it does make sense when you consider how much content the camera is creating every day. Trying to push that through a mobile data connection would not only take a long time, but probably chew through your data allowance in a couple of days too. Instead, Narrative has two different apps – one for your PC or Mac, one for your iOS or Android smartphone – to handle uploading and reviewing photos. The uploader is a simple one, though it has some thoughtful elements. Plug in the Clip via USB (a short cable is included) and it first pulls all the images off it to a temporary cache; a pop-up message tells you when it’s safe to unplug, leaving the computer to get on with uploading. I had a couple of occasions when the app would stall in uploading, though restarting it always fixed that. Optionally, you can have the uploader app save a permanent local copy of those photos, though Narrative warns that can quickly dominate your hard drive. Figure on about 3GB per day if you choose that option; you can also turn off uploading to the cloud, though then you miss out on the company’s intelligent photo processing. After waiting for the upload to complete, the app tells you how many “moments” Narrative has created, each a package of what it believes to be themed events from your day. The usual amount I ended up with seemed to be 3-4 per day, and they’re reviewed using the smartphone app; right now there’s no browser or tablet interface. Both the iOS and Android apps are basic but functional. The main screen is a scrolling timeline of moments organized by date, some of which also get geotagged with their location. Tapping each opens up the gallery of photos, trimmed down by default; a switch underneath shows all of the pictures from that moment. A thumbnail timeline can be manually scrubbed through, or you can tap the main image and have the images automatically cycle through. Long-pressing an image opens up a simple set of options: sharing, “starring” your favorites, setting the image as the cover picture, downloading it to your phone, or deleting it. You can select one or multiple frames, and if you star images that weren’t automatically picked as being among the best, it will filter them up to the trimmed timeline. Taking photos every thirty seconds isn’t tough; what’s tricky is somehow processing them so that you’re not simply left with a full folder and no context. Assuming you put it on at 8am and take it off at 10pm, that’s around 1700 images every day or almost 12,000 a week. Narrative’s promise, therefore, is to use artificial intelligence to create something meaningful from the raw data, all automatically. When you upload photos to its servers, they’re first organized into sets by GPS and time, rotated so they’re the right way up no matter which orientation you clipped on the camera itself, and then judged on criteria like lighting, how colorful they are, how well composed, whether they’re blurred, and if there are faces in the frame. If you manually triggered the shot with a double-tap, that photo is automatically filtered up to the trimmed set. All your starred photos can be viewed in a single gallery, rather than being separated out by different moments. A year’s worth of this processing is included in the $279 sticker price for the Clip; beyond that, Narrative will charge $9+tax per month for cloud storage and moment creation. Those moments are generally pretty accurately divided up, though Narrative’s filtering system could do with getting somewhat smarter. The ratio of total to trimmed shots is generally around 2-3:1, but there were still plenty of duplicates in the ones that made it to my filtered timeline. Being able to adjust the degree of pickiness Narrative’s AI exhibits would be useful here: many moments were dominated with near-identical photos of a steering wheel or a computer, which could easily have been trimmed down to just one or two. Image quality, meanwhile, isn’t going to rival a recent smartphone, but some shots turned out to be surprisingly impressive. Obviously better lighting results in better images, though I had some pleasingly moody low-light and nighttime pictures too. Think along the lines of what you see on Instagram and other photo sharing apps; in fact you can share pictures directly from the Narrative app to your Instagram timeline. Wearing a camera, and having no way of previewing what it’s seeing, means some careful consideration is needed if you want to get usable photos. Skewed shots, where the Clip has been put on at an angle or even just the angle that you yourself are leaning at, are the most obvious peril, though I also saw plenty of wobbly or blurry pictures where the 30 second interval coincided with my walking or turning. The app is pretty good at filtering those out, though some arguably have a little artistic merit in their own right. The Clip is lightweight, but I still found it could sometimes end up pointing slightly down as it pulled at my shirt. Then you end up with a day’s worth of photos of people’s chests punctuated with whatever you were eating. I found myself frequently fiddling with the camera while I was wearing it, trying to make sure it was level and facing outwards, as well as taking occasional advantage of walking past mirrors or store windows to check it was on correctly. I also quickly realized that, just because you’re wearing the camera, it doesn’t mean it was seeing what I was seeing. Instead it looks straight ahead while you can glance off to the side. Narrative actually suggests users experiment with alternative positioning: putting the Clip on a desk or by a window, for instance, and using it as more of a time-lapse camera than a body-worn one. What responsibility do you have to tell someone you’re wearing a camera when you meet them? It’s a question I got fairly familiar with while using the Clip, though the reaction from most people turned out to be less venomous than I feared it could be. Legally, you’re in the clear to take photos while you’re in public places, and most privately owned locations – with the exception of some you could probably predict, like adult clubs, and what are considered “private” places like bathrooms and, in some states, hotel rooms – though you’re obligated to stop recording if the owner requests it. The ACLU has a good guide for photographers uncertain of their rights around camera use in public places. Just because something is legal, however, doesn’t mean it can’t be creepy. Narrative supplied me with a white clip, which proved easy to spot on my generally black shirts, but black and orange versions are offered too, and you could probably hide the camera or at least make it less obvious if you wanted to. The most common reactions I got from people spotting the Clip was curiosity and variations of “I didn’t sign a waver!” said in a not-entirely-serious way. When I offered to take it off, however, they usually turned out to be more interested in the technology and my reasons for wearing it, than they were concerned about their privacy. More than one asked me to send on “any good photos it takes of me” once they’d been processed, reminiscent of the old days of film cameras and asking friends for reprints. People were also surprisingly quick to come up with possible uses for it. Parents liked the idea of documenting day to day memories as their children grew up; other tech writers told me they could envisage wearing it during events like CES for a “behind the scenes” view of the show. The potential for misuse was recognized, certainly, but those I spoke to generally had some expectation of being photographed while about their daily lives, whether it was by other people’s cellphones or business- and state-run security cameras. “Is your life really interesting enough to be worth documenting?” one friend asked me when I showed him the Clip. Wearing it certainly highlighted to me quite how much of each day I spend on relatively mundane things: sitting in front of my computer, watching TV, walking the same streets. At a rough guess I’d say as much as 95-percent of the photos the Clip took were redundant, either because they were duplications, bad shots, or just plain dull. What remained, however, proved to be interesting. Pictures I’d not normally have thought to have taken, or have pulled out my phone in time to capture, or of events that I’d completely forgotten about. Even only having worn the Clip over the course of a few weeks, I found I could look back on some of the earlier moments and be surprised with what memories they jogged. I can only imagine how that sort of intense digital journaling will feel in a year’s time, when I can revisit the places and people I saw over the course of 2014. That’s sufficient to make me curious enough to stick with Narrative’s Clip, though while life-logging is unlikely to break into the mass market any time soon. Nonetheless, documenting our lives is only getting more commonplace, and while devices and services like the Clip are niche, there’s a sense of inevitability about them as we collect more personal data. For me, the key element of what Narrative is doing – beyond taking part in a conversation, like Google’s Glass, about expectations of privacy and surveillance – is its work on contextual processing. The amount of data we’re creating and interacting with every day is vast, and no single company has yet cracked the challenge of processing that in a meaningful, manageable way. That’ll have to addressed as wearables of all kinds proliferate.